a Max Lift, the security. MAX's MVL60122 and MVL70122 VL Pro Lift models include all the features you will find throughout the MAX lift line and more. They're outiftted with CNC machined, precision welded cradles, Nylatron® pulleys with zerk greasing, stainless steel levling cables, and heavy duty aluminum extrusions. In this lift class, the cradle bed extrusions are taller at 6" in height, both for strength and the house the oversized pulleys. Larger pulleys reduce the wear on the cable, extending it's service life. All cables diameters are increased to 3/8", for increased lifting strength, and the main lifting cable is the same style used in tow trucks. Additional welded supports are found in the tower frames of the MVL60122 and MVL70122, and the MVL70122 sports larger tower and spreader plates. These lifts are the prfect choice for today's bigger triple tube pontoons and wakeboards boats. 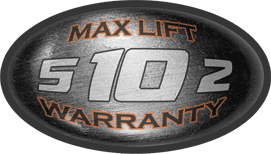 Max's MVL70144 lift is loaded with features you won't find in any other lift currently on the market. 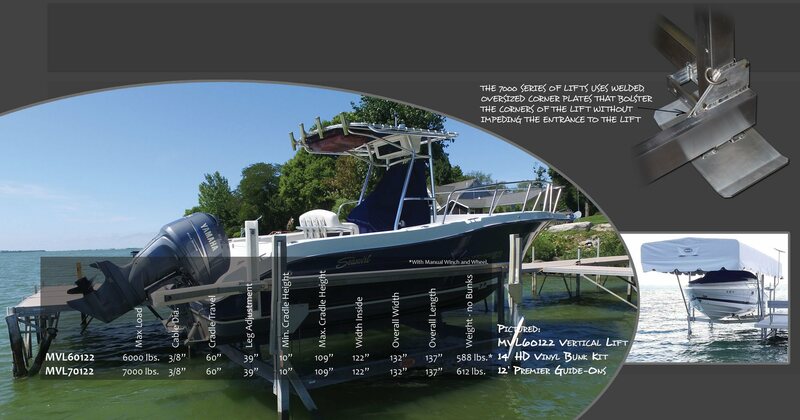 It measures 14 ft. long and has an inside beam of 144", providing more room for loading your boat without fear of damage. It incorporates the Max Tri-Cradle, which mirrors what trailer manufacturers do when building trailers for today's sophisticated boat hulls. The center cradle design allows the use of multiple lengths of bunks - as short as 9' - to provide optimum support for your investment while docked on the lift. This puts the bunk support where it's needed without the added expense of using unnecessarily long bunks which don't make contact with the hull over the entire length. It works best for tri-toon pontoons with different size tubes, fiberglass boats with stepped hulls and varying dead rises, or inboards with taller fins or unique hull designs. Max's MVL70144 lift is loaded with features you won't find in any other lift currently on the market.It measures 14 ft. long and has an inside beam of 144", providing more room for loading your boat without fear of damage.It incorporates the Max Tri-Cradle, which mirrors what trailer manufacturers do when building trailers for today's sophisticated boat hulls. 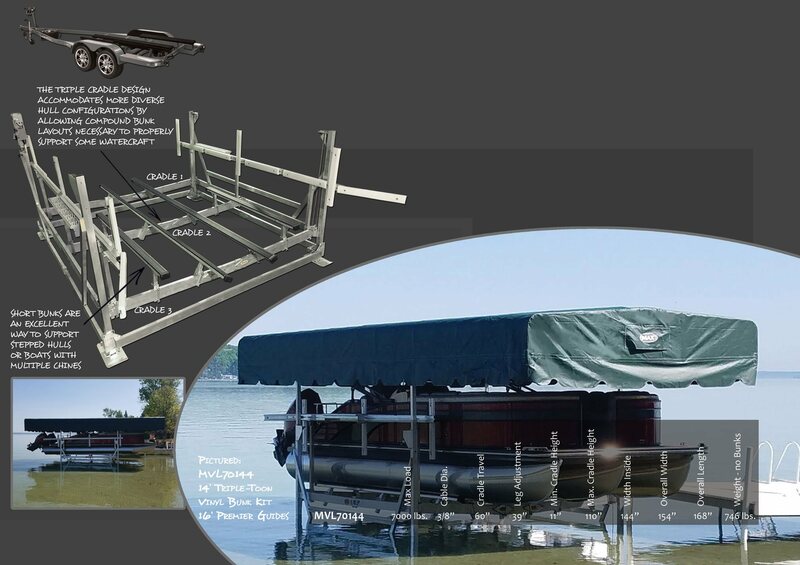 The center cradle design allows the use of multiple lengths of bunks - as short as 9' - to provide optimum support for your investment while docked on the lift. This puts the bunk support where it's needed without the added expense of using unnecessarily long bunks which don't make contact with the hull over the entire length. It works best for tri-toon pontoons with different size tubes, fiberglass boats with stepped hulls and varying dead rises, or inboards with taller fins or unique hull designs.